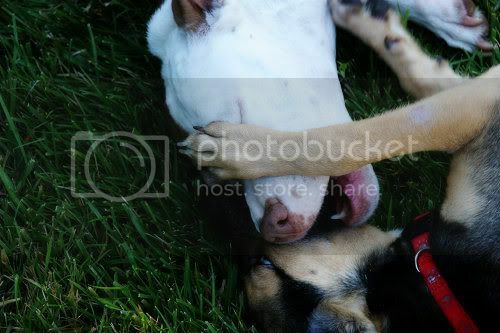 The Mina and Celeste Chronicles depict the antics of my two ever-precious canines, Mina and Celeste. Me: Celeste! Is that a book in your mouth? Mina: Ha! You, pup, are in SO much trouble. The minion thinks books are like liver treats laced with dog-friendly chocolate. Me: Celeste, books are for reading, NOT chewing. Celeste: I was reading! With my teeth! It's a new skill I've been practicing. Me: *sigh* Well stop, your teeth are taking Lost in a Good Book too literally. Celeste: *huff* Well, fine. I'll just go chew on my big sister! Hey, big sister, let me chew on you!! Please! Mina: First, I'm NOT your big sister, I don't care what that crazy guy said. Second, OUCH! QUIT IT! And then Mina ate Celeste. It was bound to happen. See evidence below. hahahahahahahaha!!! this is so great. i love it when they eat each other. :) "i ADORE YOU! now c'mere and let me eat your face!" Last night the Pook was all "NOM NOM HARD TO FIND FIRST EDITION BOOK BY YOUR FAVORITEST AUTHOR EVER NOM NOM!" I'm in yer archive commenting a year later. Mwa ha ha!